I love doing Stamp-A-Stack classes. And, Christmas cards are the perfect project for this type of class. For my first SAS class, I designed elegant cards using the Joyous Noel 6×6 Glimmer Paper in the Holiday Catalog. I just love the colors of this glimmer pack: Copper, Merry Merlot, and Tranquil Tide. One thing I also try to do is not use the Big Shot for these since we are making a dozen cards. That way, everyone can finish 12 cards in 3 hours, plus if they want to make tons more, the designs are easy to duplicate. I made these at my retreat last weekend plus another set for a SAS in October. I’m in love with the Dashing Deer stamp set…I think I made about 4 Christmas card designs using that bundle so far. This eclipse technique has been around for a while, but seems to be very popular over the last few months. I did a mother’s day card for my club using this technique with the Springtime Foils paper from sale-a-bration last month. There are certainly more complicated ways to do this technique, but I like this simple way of using dark card stock under heavier specialty designer paper that is simply one layer popped out on dimensionals. Stamp or color your top piece before punching or running it through the Big Shot. Also, make sure you save centers of images or letters (like the “O”) since you need to use every piece that you cut out to put your card front back together like a puzzle. Just set the “O” where it came from in order to stick down the middle into the right spot. 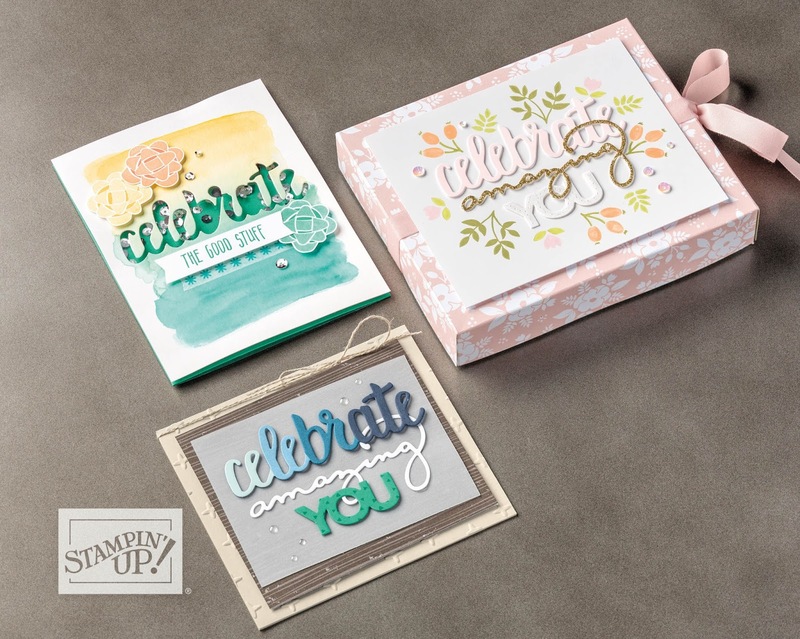 Tip: If you have the Springtime Foils paper, it colors best with lighter Stampin’ Blends colors. The darker colors tend to cover up the metallic details. I should have used glue dots on this one…oops! Let me know if you need a copy of the new catalog. I can mail them out starting now. I know Sale-a-Bration is over, but I have a few more cards to share from my recent classes. The Lots of Lavender stamp set is so quick and easy. If you managed to get this freebie last quarter, here’s another card idea. I used the Shimmery White card stock for the water-colored background since it resists water better than regular Whisper White card stock. I always put an insert in my cards to write or stamp additional greetings and images on. It gives it a more finished feel and nicer weight. I usually wait on additional greetings though until I know who I’m sending it to and for what occasion. The white piece above is the inside insert for this one. I got married and changed my name in September, so it seems fitting to re-invent my website too with a new look and a new name. I’m so excited about my name change to Green Moon Stamp Studio. It fits me since I’m a moon-child hippy chick. Green is also my favorite color and now also in my name, Greenlee,…how lucky is that??? The new logo and site which is in progress (possible viewable as you’re reading this, but if not, then very soon) is inspired by my Scottish and Irish roots and my love for the moon and nature. I will start posting and doing videos more often now that my life is settling into a new groove with my amazing husband. Oh, and don’t forget there’s only about a week and a half before Sale-A-Bration is over. Get free stuff with every $50 or $100 purchase. 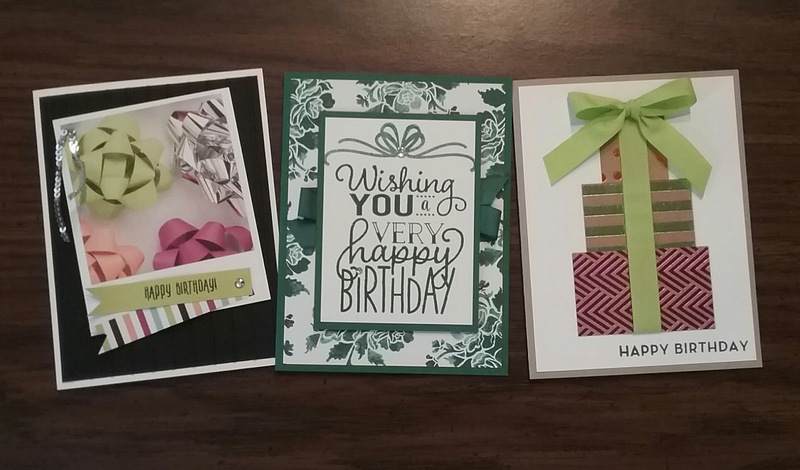 Last month, I did a birthday card stamp-a-stack class with these 3 card designs. Thought you might enjoy seeing them.